The vertical posture, peaked head, and long tail identify our quiz bird as a flycatcher of some kind. Kingbirds have heavier all-dark bills and are bright white or yellow on the underparts. The Myiarchus also have mostly dark bills and show rufous in the tail. Phoebes have entirely dark bills. Female and immature Vermilion Flycatchers have streaked underparts. Among the Contopus flycatchers, Olive-sided and Eastern Wood-Pewee have darker sides and spotting on the undertail coverts; the undertail coverts of our candidate are clean and unmarked. Flycatchers of the genus Empidonax are notoriously difficult to identify. Yellow-bellied is the easiest owing to its yellowish belly and throat. The underparts of our quiz bird are mostly whitish. Least Flycatcher always shows a conspicuous white eye-ring; our quiz bird has a weak, barely noticeable eye-ring at best. The weak eye-ring is also inconsistent with Acadian Flycatcher. Acadian Flycatchers are also green in the facial area, while the facial area of our quiz bird looks brownish-gray. That leaves the very similar Willow and Alder Flycatchers. There are average differences between these two sibling species, but they are still very difficult to separate in the field. Alder is generally a more contrasty bird than Willow, with a more obvious eye-ring and a darker face and sides. These differences are however less obvious in summer when birds are worn. The lack of an obvious eye-ring on our quiz bird favors Willow, as does the lack of strong contrast in the face. Because these two Empidonax species are so difficult to tell apart, respondents were given credit if they said Willow, Alder, or Trail's Flycatcher. 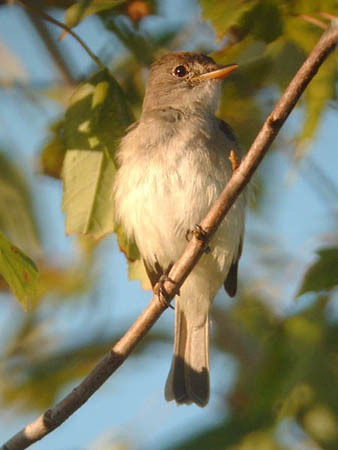 This Willow Flycatcher, part of a nesting pair, was photographed at Montrose Point in Chicago on July 28, 2005.